Nintendo and Intelligent Systems's 1989 Game Boy-based Breakout clone Alleyway is making its way to the 3DS Virtual Console, outed by a recent ESRB rating. 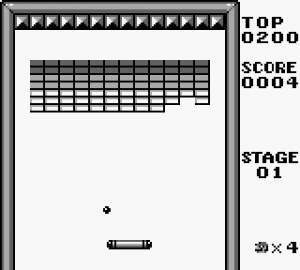 This is an action game in which players use a paddle to rebound a ball into rows of breakable bricks. Players' objective is to clear the game area of bricks while keeping the ball from falling to the pit below. Stay tuned to Nintendo Life for a full review soon after Alleyway hits the eShop. Will you be downloading this interstellar brick-breaking adventure? This is first-party? Weird. I'd really rather they work on bigger-name titles, but whatever. Uggh...why. This is probably the most boring game for the Gameboy(IMO). BTW, there are a ton of meh games like this one available for Gameboy. Get ready ppl! Glad to see we're breaking new ground. Oh man played this a bunch back in the day. While newer versions use multi-balls, large paddles, and other upgrades, this one keeps it simple. Glad to see it revived. Don't expect big name games. MAYBE a couple games from Square and Konami, but don't get you're hopes up people. Oh and SOME Nintendo games are a given. I had a lot of fun with this, very addictive and it had some mario themed bonus levels. Don't think I would want to play it now though. I'll still buy it. Any game that's Nintendo brand I'll most likely buy. As long as again It's not too expensive. i wanted this game, and its coming! this title rocked my childhood on that good old gameboy. Breakout clone by Nintendo? Interesting. I hate to be a downer, but exactly how many games on Game Boy can be considered classics without taking GBA into account? Got this on one of those dodgy 30 in 1 cartridges when I was little. Still around somewhere. Its an ok game. It was fine for short bursts but I wont be buying it again. If I ever want to play it again ill just dig up that cartridge and play it on there. @brandonbwii: There are roughly 700 original Game Boy games and about 500 Game Boy Color games. I owned this on my Game Boy and actually really enjoyed it! I owned this on Gameboy back in the day. It's a simple but fun game. I might buy this if it's reasonably priced. @Rathe: That's not what he asked. He asked how many of those can be considered classics! Certainly not ALL of them. Arkanoid was one of the best games ever back when I had a Macintosh computer. I'd love a good Arkanoid/break-away type game for the 3DS, especially with the circle pad for playing. Played this a lot back in the day. Be warned, there is NO music during the gameplay, except during bonus rounds, so it may bore some players. I'm sure there'll be a Breakout 3D or something, but Nintendo should try and get the original Tetris on the 3DS VC. I loved this game back in the Gameboy era. I remember visiting my brother in Chicago back in 1990 and he had this game on Gameboy. I played it all the time I was there. I never did get Alleyway on GB so I will definitely will get it once I get a 3DS. This wasn't a very good game.. but it was also one of the first Gameboy games I ever owned and would probably be grossly nostalgic enough to warrent a purchase. Fortunately, by the time I buy a 3DS I'm sure there will be far better and far more nostalgic-ier games for me to blow my money on. We have Game Boy, Game Boy Color, Game Gear and TurboExpress for now. Do you guys think we are going to see old Mobile games? That I want to see ALOT. The only thing possibly interesting about this game is that the driver of the paddle is actually Mario. This is going to be free, right? is this worth paying money for? If it's really cheap then I'd buy it, these simple games are great for killing time. Also, it has Mario in there somewhere. Flat out LOOKS like Arkanoid, but... eh... Just announce Metroid II: Return of Samus and Kid Icarus of Myths and Monsters and I'm sold. OMG I just realized it's June!!! Alleyway still plays better than most of the iPhone brick breakers. With the exception of Atari and Taito. Sweet, i heard this was one of the best Arkanoid clones ever. This game is basically Arkanoid but with Mario in that rectangle thing. @brandonwii: A lot more than you think. Most major franchises appeared on the old GB/GBC. Not all of them were great but most of Nintendo's major properties fared pretty well, such as Super Mario Land, Wario Land, Metroid and Zelda. Konami was also a big supporter with big titles like Castlevania and Contra. Not to mention Metal Gear Solid for the GBC. Square pumped out quite a few RPGs and Action RPGs. Enix started churning out the Dragon Quest remakes on the GBC. Just about every major franchise at one point or another ended up on the gameboy systems. And maybe we'll finally get to play those cult favorites like Shantae. Granted the is a lot of garbage on both systems (GTA 1&2 for the GBC?) Hopefully these old game boy games aren't more than $3. I'm also curious to know how the games will be emulated. Will they feature "widescreen" support kind of like how Wii VC games do, since the GB/GBC had a square screen. Will they feature color, or color modes? Some games such as Metroid 2 were designed for the Super Game Boy accessory for the SNES, and featured a limited color pallet. Will we be able to access these color options? The 3DS VC has huge potential, if Nintendo gets it right and 3rd parties don't skimp on their good games. I also doen't want to see multiple versions of the same game i.e., don't release Link's Awakening, then a year later Link's Awakening DX. There is potential for gamers to experience some real gems they may have missed. Afrancio -> Did you have the same childhood as me? I loved Solar Striker! As soon as they announce Revenge of the Gator, though, I'm buying like twenty 3DSes. Ah! I remember alleyway. Should be addictive as before and good value for cash too. I have the original game and I would not suggest downloading this. My parents bought it for me when I was 12. It was okay then. Playing it now...not so much. I gotta say I love that box cover. fun game very similar to arkanoid but some stages are in the shapes of nintendo characters.